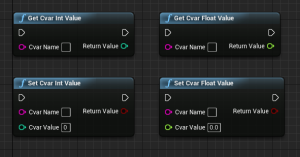 While working on a project recently, I needed a way to be able to easily access CVar values from Blueprint, something I couldn’t find any support for in UE4.10. To this end, I created a simple plugin that exposed a way to get and set the values of CVars from Blueprint. Primarily this could be used for things like video settings, where some of the lower level settings you may want to access aren’t exposed to Blueprint. Examples are CVars like r.RefractionQuality, r.ReflectionEnvironment, r.MaterialQualityLevel and others. 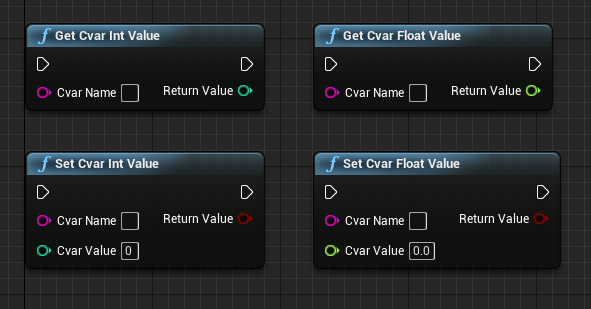 The plugin is quite simple to use: There are 4 Blueprint nodes, which are Get & Set nodes for int and float CVar values. The cvar is set instantly when using the Set nodes, so if you need to do any saving or confirming (such as in the case of video settings) you will need to cache the results yourself before setting. You can download the plugin Here. Simply put the CVarAccessor folder inside your Game’s Plugins folder to use it. Its currently compatible with 4.10 only.